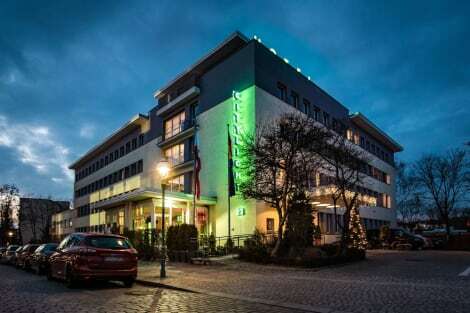 This cosy hotel is situated in Treptow. With a small number of only 11, this hotel is very convenient for a quiet stay. No pets are allowed on the premises. With a stay at Hotel 103, you'll be centrally located in Berlin, a 4-minute drive from Max-Schmeling-Halle and 8 minutes from Berlin Wall Memorial. This hotel is 2.5 mi (4 km) from Friedrichstrasse and 2.7 mi (4.3 km) from Alexanderplatz. With a stay at MEININGER Hotel Berlin Alexanderplatz, you'll be centrally located in Berlin, within a 10-minute drive of Friedrichstrasse and Berlin Wall Memorial. This hotel is 1.4 mi (2.3 km) from Alexanderplatz and 1.6 mi (2.6 km) from TV Tower. With a stay at Pfefferbett Hostel Berlin in Berlin (Prenzlauer Berg), you'll be a 4-minute drive from Friedrichstrasse and 5 minutes from Berlin Wall Memorial. This hostel is 0.6 mi (1 km) from Hackescher Markt and 1.3 mi (2 km) from Alexanderplatz. With a stay at Familienhotel Citylight Berlin in Berlin (Mitte), you'll be within a 10-minute drive of Berlin Wall Memorial and Friedrichstrasse. This hotel is 2.4 mi (3.9 km) from Friedrichstadt-Palast and 2.9 mi (4.6 km) from Reichstag Building. Located in a 19th-century factory building, this hotel in the lively Prenzlauer Berg district of Berlin offers a 24-hour bar and breakfast until 12:00. Alexanderplatz Square is 8 minutes away by tram. Hotel Transit Loft provides brightly decorated rooms with high ceilings, small seating areas, and safety deposit boxes. All include a private bathroom. The Transit Loft’s reception is open 24 hours a day. Free Wi-Fi is available in the Loft’s public areas. Hufelandstraße Tram Stop is a 5-minute walk from the Transit Loft Hotel. Trams run directly to Alexanderplatz Square from there, 24 hours a day. The Transit Loft is an 8-minute walk from the large Volkspark Friedrichshain Park. The trendy Kollwitzplatz Square is just a 10-minute walk away. Enjoy the recreation opportunities such as bicycles to rent or make use of other amenities including tour/ticket assistance.